Canggu (pronounced chan goo) is the name given to an area that's home to two villages west of Kerobokan in the south of Bali. The first village to the west of Kerobokan is Tibubeneng, which is home to Berawa beach and the can't-miss-it Canggu Club. The next village to the west is Canggu, and is home to Batu Bolong beach and Batu Mejan beach (better known as Echo beach) along with a range of good eating and sleeping options. The beach immediately to the west of Echo beach is called Pantai Pererenan and is only now showing signs of development reminiscent of the sort going on in Canggu and Kerobokan — that is, mass replacement of ricefields with concrete monoliths. While not as immersed in villa construction as Batu Belig further south, there are still luxury villas going in left, right and centre across this entire area. If you want to see paradise getting concreted over this area is a prime example as once endless ricefields are slowly replaced by tall walls hiding completed or nearly completed luxury accommodation. It was probably a solid idea for the first handful of people, but as development marches on, villas with views of padi are being replaced with villas with views of villas — with views of villas. Now, the charm of this area is shifting towards the hedonistic vibe of Seminyak — and at times has the traffic to match. While they're all pretty much a continuation of the same strip of sand, each of the beaches of Canggu has its own vibe. Berawa Beach is the closest to Seminyak (you can actually walk there along the beach from here) and has a large beachfront hotel. Next up Nelayan Beach swaps a hotel for some fishing shacks, while west-still at Batu Bolong the luxurious Hotel Tugu resides along with some great eateries. Echo Beach is the best known of the beaches in the area thanks to the very well-known Echo Beach Club, while the western-most Pererenan Beach is probably the quietest of the lot. It's very low-key on the run down from Raya Canggu — lots of luminescent green rice fields, and while there are a smattering of villas, it's not nearly as built up as further to the south. That said, when you do reach the beach head, an amazingly corpulent private residence lies to the immediate west, but like the rest of the area, it's low key. To the east is the cheap Nyoman Homestay and a miniscule warung that can do simple snacks and iced drinks. The beach out front here is a big rock shelf and doesn't look great (at all) for swimming, but if you climb over the rocks (easy to do) then quite a pretty little crescent of sand just after that is great for laying around, and, depending on how the sea is behaving, probably safe for a swim. If you come here just to lay around rather than to surf, rest assured you'll have most of the place to yourself. The central part of the beach is long gone, replaced by a substantial retaining wall which both protects and provides a large recreation area to some of Canggu's restaurants, best known of which (and famous for its barbecues) is Echo Beach House. With benches, tables and umbrellas scattered in front of the sea, and the surfing happening within easy eye shot, it's a great place to nurse a few cold drinks, munch down on the food and enjoy the show that goes on on and out of the water — no shortage of posers here! The beach immediately out front is not a swimming beach, but both to the north and south are sand strips you can relax on — watch any valuables you leave on the beach. To the south of the retaining wall sits the sprawling Sea Sentosa Development. You'll see the jukungs pulled up onto the top of the sand dune with little storage shacks straight behind them. There's not much happening here through the day, but early morning it can get pretty busy. When the sea is too rough for them to get the boats out, you may see them line fishing off the beach. Nelayan is less of a surfing beach and there's plenty of sand if you just want to lay around. What there isn't though are warungs or drinks sellers — at least we couldn't find any — so bring your own water and snacks. Just to the south of the road lies the Legong Keraton Hotel, but you'll find most of the surfers are staying either at one of the cheap Canggu homestays back off the beach or further still afield. It's good surfing, but the waters here are also straightforward enough for a simple swim and there is plenty of sand for relaxing or running around on. If you walk south, you'll pass a massive half-built and seemingly abandoned hotel, then a lagoon. At the far side of the lagoon is a wobbly bamboo suspension bridge that leads to Warung Agung Kayu Putih — one of our favourite spots in the area for a sundowner. Keep walking south from here and you'll reach Batu Belig, putting you into Seminyak (as far as Travelfish is concerned!). Save the luxurious Hotel Tugu, Old Man's restaurant and a few warungs, there's little in the way of development immediately around Batu Bolong. Grab a patch of sand and stake out some territory. As far as Canggu eateries go, the very impressive and very bamboo Old Man's restaurant gets some very big thumbs up from us. 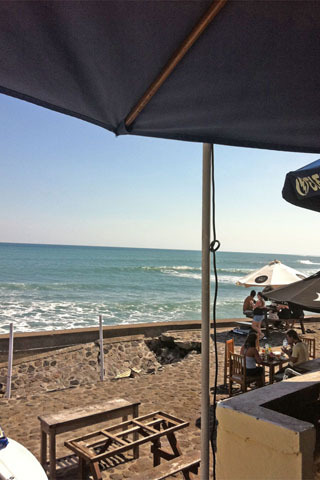 If you're not surfing, this is a great spot to take in the scenery and enjoy some excellent food at reasonable prices. If you'd prefer something less fancy, there's a couple of warungs facing onto the car park. Immediately to the south of the car park sits Pura Batu Belong — needless to say don't go wandering through there in your swimmers. If you're keen to surf, a bunch of surfers hang out here and you can hire one for a private lesson -- the going rate is 350,000 rupiah for two hours. They usually won't negotiate any lower, but if you have two kids, you can swap the kids around so they get an hour each. Old Man’s is a fab spot for a lazy brunch, breezy lunch, relaxed dinner or drinks into the night. The open-air restaurant overlooks Canggu’s Old Man’s break (with a car park in between) making it an easy spot to duck into after a surf — and a good sunset possie. The food is excellent, with a straightforward menu of international hits, all executed well with a focus on simplicity and good produce. A solid kids’ menu helps keep everyone happy. The coffee is super-smooth, the cocktails potent and the vibe relaxed. Plan for a lengthy stay. Walk past Finn’s on Berawa Beach and head 200 metres along to the right to find The Naked Coconut, an old-style on-the-beach warung. Expect nothing more than a few bean bags plus some roughly hewn wooden chairs ideal for chilling in with your toes curled into the sand. The beer’s ice-cold, they will order in snacks from warungs nearby for you (try the basic nachos) and you can watch the sun dip behind the waves, the old-school way. Check their FB page for irregular music sessions. Echo Beach has a cluster of beachside warungs ideal for a no-fuss sundowner with your feet in the sand and your but in a bean bag or on a sun-lounger. When you get to the end of Batu Mejan and hit the sands, just take a right and wander along. There are around a dozen or so shacks to choose from, all associated with the loungers out the front; we like the little Japanese one, where the service is friendly and the food a little bit different from the usual nasi and mie goreng. Have you got a few months? Because you can pretty much try a new cafe a day in Canggu over this length of time and still have more to try. So many are worth mentioning — here are some of our faves, starting from the Berawa area and moving north to Echo Beach. Our only complaint: jeez we wish ALL cafes served a bottle of water on arrival, even if, like Crate, they charge a minimal 5,000 rupiah service charge for it. It's hot—don't make us buy an overpriced bottle of Equil. Rant over! Bali Buda: Jalan Raya Banjar Anyar 24, Canggu; T: (0361) 844 5936; www.balibuda.com; open daily 07:00-22:00. Betelnut Cafe: Jalan Batubolong No. 60, Canggu; T: (082) 146 807 233; open Tues-Sun 07:00-22:00. Bungalow: Jalan Pantai Berawa 35 A Canggu; T: (0361) 844 6567; www.bungalowlivingbali.com; open Mon-Sat. Cafe Avocado: Jalan Raya Batu Bolong 69B, Canggu; T: (0811) 399 9411; motionfitnessbali.com/food-solutions/avocado-cafe-menu/; open daily 07:00-22:00. Cafe Organic: Jalan Pantai Batu Bolong 56, Canggu; open daily 07:00-16:00. Cafe Moka: Jalan Raya Anyar, Canggu; T: (0361) 844 5933; http://www.cafemokabali.com/; open daily 07:00-20:00. Canteen: Jalan Batu Mejan 33, Canggu; T: (0878) 6228 1755; open daily 07:00-17:00. Crate Cafe: 64 Jalan Batu Bolong, Canggu; T: (0812) 3894 3040; open daily 07:00-03:00. Deus Cafe: Jalan Batu Mejan 8, Canggu; T: (0811) 388 150; www.id.deuscustoms.com; open daily 07:00-23:00. Grocer and Grind: Jalan Batu Mejan (100m from beach), Echo Beach; T: (0361) 846 9189; www.grocerandgrind.com; open daily 07:00-22:00. Gypsy: l Munduk Catu 1, Canggu: T: (0812) 3067 0056; open daily 08:00-23:00. Le Petit Prince: 65 Jalan Batu Belong, Canggu; T: (0858) 5672 8087; open daily 09:00-22:00. Little Flinders: 78 Jalan Pantai Batu Bolong, Canggu; T: (0361) 4715238; www.facebook.com/littleflinderscafe/; open daily 08:00-22:00. Monsieur Spoon: Jalan Batu Bolong 55, Canggu; T: (0878) 6280 8859; monsieurspoon.com; open daily 06:30-21:00. Peloton: Jalan Pantai Berawa 46, Canggu; T: (0859) 5413 1451; www.pelotonsupershop.com; open daily 07:30-16:30. Samadi: Jalan Padang Linjong 39, Canggu; T: (0812) 3831 2505; www.samadibali.com; open daily 08:00-19:00. Shady Shack: Jalan Tanah Barak; T: (0819) 1639 5087; open daily 07:30-22:00. Warung Gouthe: Jalan Pantai Brawa 7A, Canggu; T: (0878) 8947 0638; open Mon-Sat 08:30-17:00. If coming from Seminyak, the most straightforward route is to take Jalan Raya Kerobokan and take a left onto Raya Canggu. Running off Raya Canggu to the left are Raya Semer (for Umalas), Raya Pantai Berawa (for Berawa Beach), Raya Batu Bolong (for Batu Bolong/Canggu) and lastly Padang Lijong (for Echo Beach). None of these are signposted, so look for hotel signs. Despite all the development, this area is still far enough off the tourist trail that no shuttle buses travel here and bemos are all but impossible to utilise. Cabs to here from the Kuta/Legian area run at about 60,000 rupiah.